Strangemen & Co.'s The Woodsman at 59E59 Theaters in New York City. "Into the woods, and who can tell what's waiting on the journey?" A fair question posed by Little Red Riding Hood in Stephen Sondheim's musical masterpiece, Into the Woods, which will have its big screen debut on Christmas Day. Well, "Red," there's love, murder, jealousy, theft and a serious fetish for some thick and healthy blonde hair. Honestly though, not much more than you'd find on primetime TV. So why the obsession with the woods? Since the days of Grimm, there's been an infatuation with the forest told through tales like "Sleeping Beauty," "Snow White," "Hansel and Gretel," "The Wonderful Wizard of Oz," and many more. It happens outside of these tales too, as we flip the pages -- or through the remote -- willing to get lost in what may be considered, by today's standards, a "totally #basic" storytelling device. 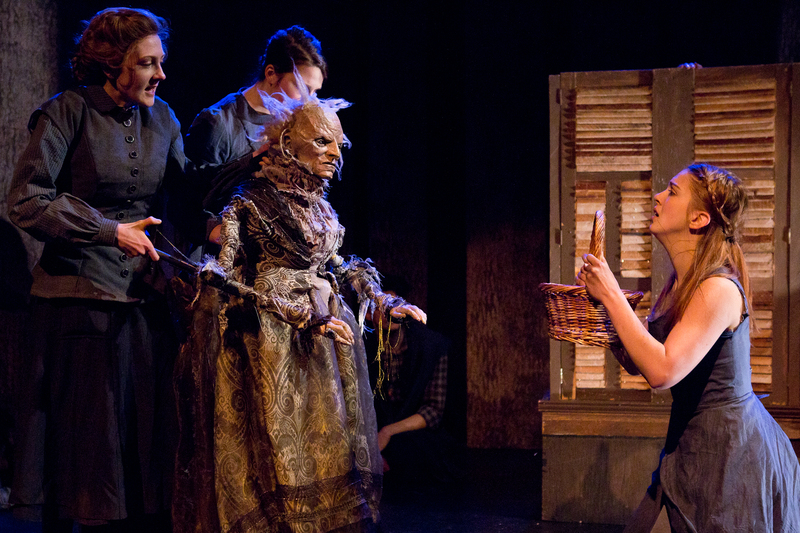 To get some insight onto this love of the woods, I turned to James Ortiz, co-artistic director of the innovative puppet theater organization, "Strangemen & Co.," and actress and director, Claire Karpen. "I think it's primordial." Ortiz says. "It's the landscape of the mind. It's both frightening and transcendent. It's dangerous and it's welcoming. It's a series of contradictions. Secrets can happen there, which allows for a lot of extraordinary things"
Karpen agreed, but also sees it as an analogy for discovery and personal growth. "It's a place that you go to face challenges," Karpen adds, "you learn about who you are by how you handle those different challenges, and then you return back to the world a changed person." Ortiz and Karpen know a thing or two about the woods. Ortiz's show, told through innovative human-like and -sized puppets, The Woodsman, is a retelling of the story of the Tin Man of Oz. Karpen does double duty in the woods too -- she directed The Woodsman with Ortiz, which is currently mounting a return engagement at 59E59 Theaters in New York City -- and stars as Cinderella in the stripped-down off-Broadway revival of Into the Woods. Both productions will celebrate the official opening next month. Having explored the landscape of fairy tales in developing The Woodsman, Ortiz notes that much of the use of forest and woods in western culture dates back to Grimm's fairy tales as they were, "effectively talking about the Black Forest in Germany. Of course, when those stories were written, the woods were actually borders between countries," Ortiz points out. "Why would you cross them, these endless woods? It would be dangerous." Although the mystery may have first been rooted in tangible risk and fear, Karpen sees it now as an opportunity to escape from our modern day situations. "I think that we're in a world where it feels like you know everything... information is so easily accessible," Karpen says. "I think we long for mystery, which is part of the human experience. People are eager to go back to places that are unknown and surprising, and experiential." "I think that our culture right now is so technological and in some ways so virtual, and our response to that is that we're really hungry for things that are tangible," Karpen continued. "There's something about the woods, and the mystery of the woods that needs to be experienced... which is why I also think people go to the theater." Experiences are what Ortiz and his team at Strangemen create. They craft life-sized puppets for the actors to manipulate and essentially emote through, bringing out creatures who are unlike us in their appearance but are instead humanized through their behavior. Just as there's an opportunity for us all to rediscover something in the woods, there's an opportunity to refresh the stories found within them -- brush them off and find a new, and possibly more relatable and contemporary reality. Same as how Gregory Maguire took a fresh look at "The Wonderful Wizard of Oz" to create his best-selling novel, Wicked (itself a mega-hit musical featuring the songs of Stephen Schwartz), Ortiz himself dove deep into the story to find a passage that would shed light onto the "life" of the Tin Man. "In the original book, it's a paragraph. It's a very small notion," Ortiz says. "The Tin Man was originally a human being, a munchkin that fell in love with a girl and through a series of unfortunate and awful events, ends up mutilating himself," Ortiz explains. "Because he's so in love, he keeps cutting and keeps chopping and keeps trying to build a home for him and his bride to share together. Through a cycle of violence and his own stubbornness, he doesn't stop, and each of his limbs gets hacked off and replaced with a tin part. He goes to a tinsmith to get all his limbs replaced, until eventually he becomes something that is literally heartless. He doesn't have anything inside of him." In some ways a cautionary tale, we often build walls that inevitably -- intentionally or not -- shut out the ones we love the most. Ortiz explains, "he doesn't have it inside of him anymore to love her back, and then he rusts alone in the forest... there's a great story right there." Karpen sees a similar comparison in both The Woodsman and new revival of Into the Woods. "In both of these we're reexamining these stories," Karpen says. "In our version of Into the Woods, we're telling that story in a new way that's stripped down and acting-based, and is a whole new take on that musical that everyone is aware of. Because it's new, it feels like they're experiencing it for the first time. I think the same thing with The Woodsman, because we're using things like puppets and some really magical modes of storytelling, that's helping us tell that story for the first time.'" "More importantly," Ortiz adds, "I think the material is a parable for life, really. How many times do we feel like we are incapable of being the person that we are, and we have the path that's right in front of us and its [up to] us whether or not to take that path to whatever 'Emerald City' we want to get to."